ALBUQUERQUE, N.M.—Thousands of Native Americans, including 32 seniors from the Big Cypress Reservation, flocked to Albuquerque, New Mexico last month to celebrate culture and heritage at the 33rd annual Gathering of Nations Powwow and Miss Indian World pageant. 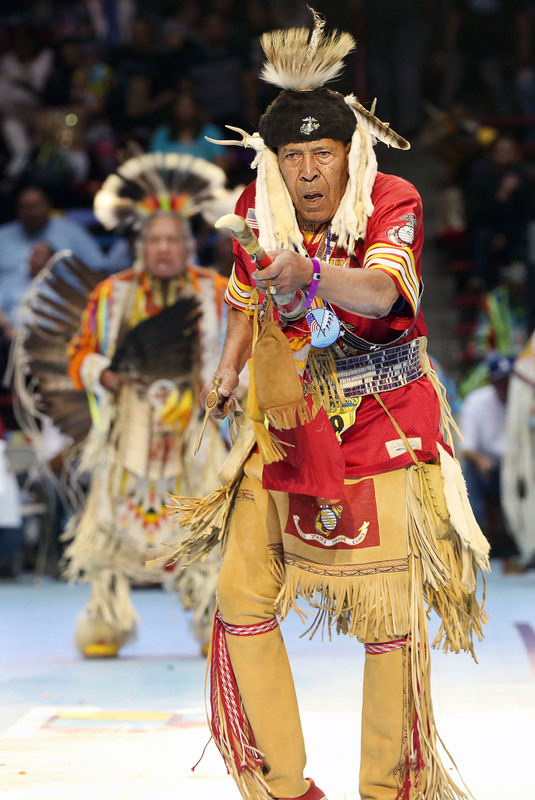 About 3,000 drummers and dancers representing 700 Tribes from the U. S., Canada and Mexico attended the April 28-30 event to compete, reconnect with old friends and, for some Seminole seniors, soak in the diverse Native American culture. Many of the seniors had been to the Powwow before and looked forward to buying beads and fabric that can’t be found in Florida. But the primary reason for their visit was to participate in the enormous Indian Country assembly. “It’s amazing to see all the dancers, it feels like you’re part of it,” Paul Bowers said. “We are, and that makes it extra special,” added his wife Charlotte Bowers. 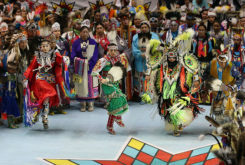 It took almost an hour for thousands of dancers of all ages to descend to the bottom of “The Pit” arena floor at the University of New Mexico for each of the four Grand Entries, the traditional start of the Powwow. 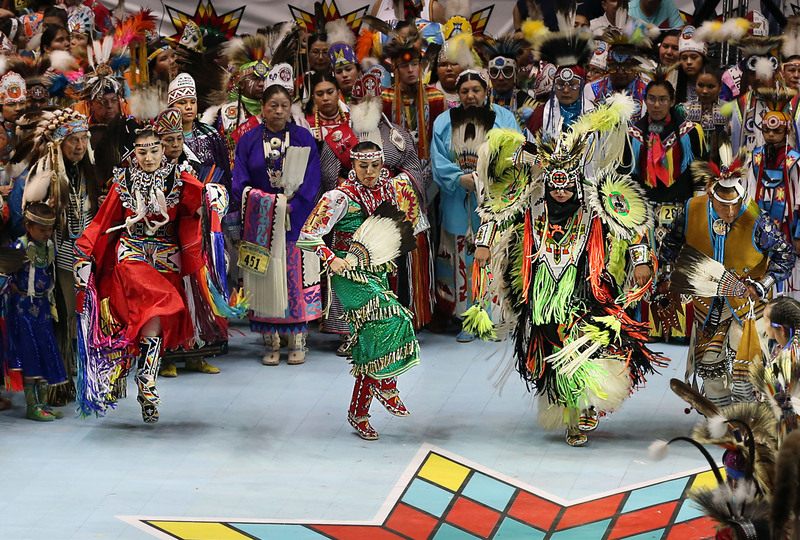 Dressed in colorful regalia embellished with feathers, beads and bells, the dancers moved down the steps from all sides of the arena until the floor was so full, dancers could only bob up and down to the beat of the drums. The pit was organized chaos as the throng moved clockwise in a slow spiral. 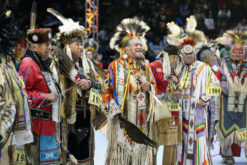 Powwow announcer Dennis Bowen Sr., of Tuba City, Arizona, encouraged the dancers as they made their way down to the floor. 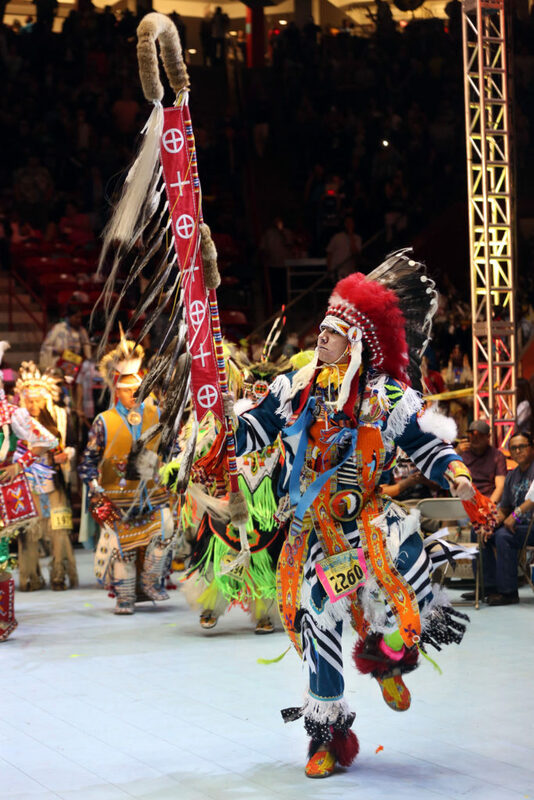 When all the dancers were finally in place, drum groups played, prayers and invocations were read and Navajo Nation president Russell Begaye addressed the crowd. With that, the 41 drum and dance competitions began. Northern, Southern and hand drums filled the arena with their rhythmic songs. Dancers in the Northern, Southern, Fancy, Grass, Chicken, Jingle, Shawl and Traditional styles made colorful swirls on the floor as they tried to keep the beat of the drum and stop exactly on the last note. Tiny tots, elders and every age group in between showed off their skill as they vied for prizes in their categories. Marty Pinnecoose, of the Southern Ute and Jicarilla Apache Tribes, has been dancing for 45 years first as a fancy dancer, then a grass dancer. He recently had a hip replacement and sat out this powwow. Medicine isn’t the only powerful force at Gathering of Nations. Last year traditional Northern dancer Josh Atcheynum, Plains Cree, got engaged to a jingle dancer. They plan to marry in August. Some dancers learn the art as soon as they can walk. Grass dancer Therien Paskamin, 17, Plains Cree Tribe, has been dancing since he was a toddler. High School student Matthew Sheka, 18, who has lineage from the Ho Chunk, Zuni, Cheyenne, Arapahoe and Navajo Tribes, has put education above powwows for the time being. The high school senior plans to attend Haskell Indian Nations University in the fall, so this was one of his last before college. His parents raised him going to powwows often. Tommy Gonzales, Tejon Tribe, attends about one powwow each month with his wife and children. They dance but don’t compete. The Gourd Dance and its emotional song honors warriors, past and present. Participants included, but were not limited to, veterans. During the dance, the announcer asked everyone to honor the dancers by putting money on a blanket to say thank you. Piles of cash quickly accumulated as people lined up to give during the non-competitive dance. Other attractions at the Gathering of Nations included the Miss Indian World Pageant, in which Miss Florida Seminole Destiny Nunez competed. The 500-booth Indian traders market offered Indian arts, crafts, jewelry, beads and food. Stage 49, a non-stop concert, starred indigenous artists who played traditional music along with hip hop, pop, rock, reggae and soul. The Gathering of Nations cultural celebration was a proud commemoration of all things Native American, past and present. 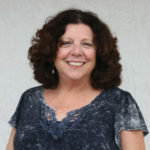 “To see this many people makes you feel even prouder to be Native American,” said Sue Jane Cypress, of Big Cypress.